One of my ExpertExpress engagements focused on BGP route maps and setting BGP attributes based on BGP communities, so I wanted to brush up my RouteMapFoo before the online session. Here are a few (not-so-unexpected) results gathered from IOSv release 15.5(3)M.
TL&DR: The continue feature works only in route maps applied to BGP neighbors. The VIRL file describing the topology (including working router configurations) is in my VIRL GitHub repository. 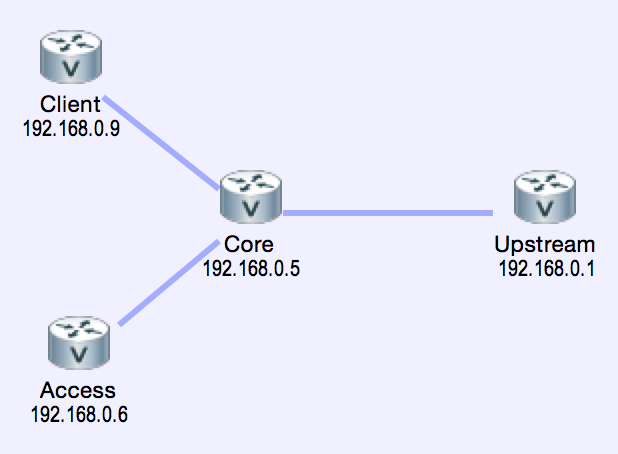 Next test: redistribute OSPF routes into BGP with a route map to set BGP attributes in the redistribution point. 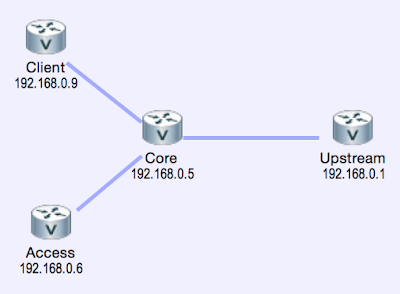 Add BGP community 64501:2000 for external OSPF routes with tag 2000. Before you ask: I had no really good reason to do that, but my customer was using something along the same lines, so I wanted to test all potential combinations. Caveat#1: EGP keyword is hidden in recent IOS releases (I’d consider that a good thing). It still works, but it won’t show in context-sensitive help. Caveat#3: You cannot use continue clause in a redistribution route-map. The lack of support for continue clause was somewhat expected after reading the relevant IOS documentation, and without the continue clause it makes no sense using set community additive in a redistribution point (where source routes have no BGP communities). In the worst case, the limitations on redistribute route-maps result in a Cartesian product of all possible match conditions. Definitely not something I’d want to configure manually. Is anyone aware of a tool that would generate route-maps with all possible combinations of match criteria automatically? I tried to use a slightly different approach on the client router: insert static routes into BGP using network statement with a route-map option. Caveat#1: The continue feature doesn’t work when using a route map in a network statement. Caveat#2: Cisco IOS doesn’t even complain. You can use set community additive command (although it doesn’t do you much good if you can’t use continue command). Same conclusions with the latest IOSv iteration, 15.6.2. Also, a slight glitch: set local-preference 2000 instead. One important thing to note is different behavior of 'implicit deny' rule, from Cisco website: 'Once a route is matched in a route map permit entry with a continue command clause, it will not be processed by the implicit deny at the end of the route-map.' So generally it's a good idea to add explicit deny rule as the last entry in route-map with 'continue' statements. Another case of non-working continue clause : VRF export map. Or maybe it counts as redistribution ?